A series of free, online video lessons with examples and solutions to help Algebra students learn about circle conic sections. 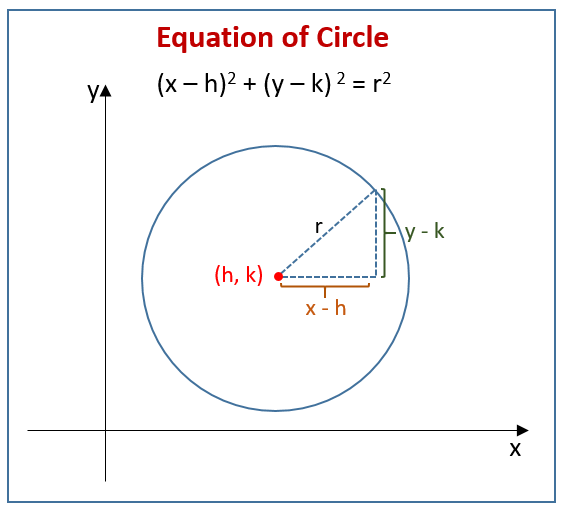 The following diagram shows how to derive the equation of circle (x - h)2 + (y - k)2 = r2 using Pythagorean Theorem and distance formula. Scroll down the page for examples and solutions. When working with circle conic sections, we can derive the equation of a circle by using coordinates and the distance formula. The equation of a circle is (x - h)2 + (y - k)2 = r2 where r is equal to the radius, and the coordinates (x,y) are equal to the circle center. The variables h and k represent horizontal or vertical shifts in the circle graph. How to graph a circle in standard form and general form? Identify the equation of a circle. Write the standard form of a circle from general form. A circle is the set of points (x,y) which are a fixed distance r, the radius, away from a fixed point (h,k), the center.